Since the U.S.-led invasion of Afghanistan in the wake of the 9/11 attacks, the area under opium cultivation in the country has increased 23 fold to an area nearly ten times the size of Washington, D.C., while production of the illicit drug has skyrocketed 18-fold, from 185 metric tons to 3,300. Opium cultivation and production has thrived over the course of the Afghanistan war despite a dramatic drop after the U.S. and NATO ended their combat mission in Afghanistan and withdrew most of their troops at the end of 2014. Amid the ongoing heroin epidemic in the United States that is killing thousands, the White House and other government agencies have sounded the alarm on Afghanistan heroin possibly flowing into the U.S. through Canada, where most of the heroin available is from Afghanistan. “There is also an increase in transshipments of Afghanistan heroin going to Canada, a development of concern that is being addressed by Canada with support from the United States,” noted the White House last year. When the U.S. began targeting the Taliban and al Qaeda in Afghanistan on October 7, 2001, the ruling Taliban government had imposed an opium ban in Afghanistan. Opium cultivation and production began to thrive again soon after the U.S. military replaced the Taliban-led government. Estimated opium production in Afghanistan in 2001 was 185 tons, the lowest since the UN began keeping track in 1994. Potential opium production reached 3,300 tons in 2015, the latest year for which data is available, marking a nearly 18-fold increase over the course of the war. Meanwhile, opium cultivation, measured by area, has grown nearly 23-fold, from an estimated 8,000 hectares (about 31 square miles) in 2001 to 183,000 (about 707 square miles) last year, an area about 10 times the size of Washington, D.C. Although the U.S. has spent an estimated $8.5 billion on anti-narcotics efforts in Afghanistan, the illicit opium business has boomed and the country is now the world’s largest producer of opium and its heroin derivative, accounting for about 80 percent of global illicit opiates. In its most recent National Drug Threat Assessment, the DEA reports that only a small portion of Afghanistan heroin, accounting for about four percent of seizures, makes it into the U.S., smuggled primarily by Nigerian traffickers on commercial airlines. In its drug threat assessment, the DEA acknowledged that Afghan heroin is found in states that border Canada. However, it also notes that that Mexico is the primary supplier of heroin in the United States, followed by South America. “In 2014, 10,574 Americans died from heroin-related overdoses, more than triple the number in 2010,” reported the DEA in June. According to the UN and the Special Inspector General for Afghanistan Reconstruction (SIGAR), a U.S. watchdog agency, opium interdiction and eradication efforts have decreased over the course of the nearly 15-year-old Afghan war, with the exception a few years including 2015. Some U.S./NATO troops have even been accused of patrolling opium fields. Furthermore, some NATO troops, from the United Kingdom and Canada, have been accused of smuggling heroin out of Afghanistan. U.S. soldiers in Afghanistan have also been investigated “on suspicion of using or distributing heroin, morphine or other opiates during 2010 and 2011, newly obtained data shows,” reported The Associated Press (AP) in 2012. Breitbart News analyzed Pentagon data showing that the number of U.S. service members testing positive for heroin has increased over the course of the war in Afghanistan. SIGAR reported in December 2014 that some U.S. taxpayer-funded reconstruction efforts may have contributed to the booming opium trade in Afghanistan. The UN notes that there was a substantial decrease in Afghan opium cultivation and production in 2015, the first year after President Obama and NATO ended their combat mission and withdrew most of their troops. Opium cultivation dropped 19 percent last year from a historic high of 224,000 hectares (about 865 square miles) in 2014 to 183,000. “The reduction in opium production was even more drastic. Potential opium production was estimated at 3,300 tons in 2015 (-48% from 2014), which is the lowest level since the Taliban opium ban in 2001,” noted the UN. 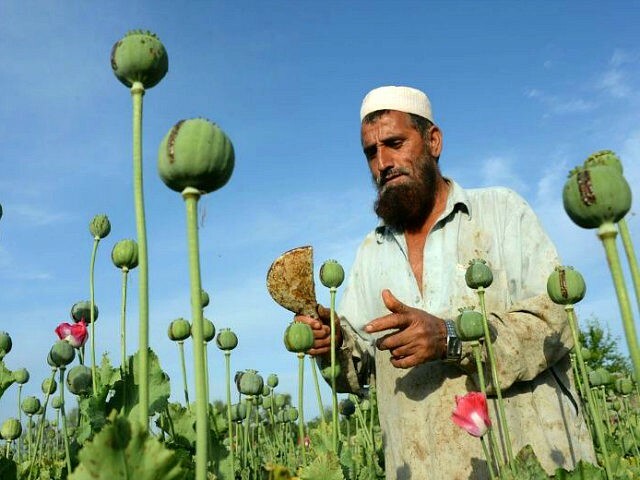 Opium cultivation and production is an important source of funding for the Taliban, which controls some of the main opium-cultivation regions, particularly in southern Afghanistan, along the Pakistan border. The Taliban controls most of Helmand, the country’s largest opium-producing province. According to the UN, the net value of the Afghan opiate economy reached $1.49 billion in 2015, a dramatic drop of 44 percent from the $2.68 billion in 2014. Nevertheless, the 2015 gross value still constituted 7 percent of Afghanistan’s Gross Domestic Product (GDP), which refers to the country’s output of goods and services.